Case studies—often referred to as customer success stories, customer stories, success stories or testimonials—are among your most powerful and versatile business tools. They provide credibility, an indispensable ingredient for reaching today’s jaded and media-savvy prospects. 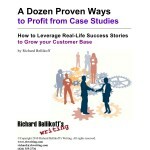 Yet many companies fail to get as much mileage as they could from their case studies. That’s a pity. They’re missing out on some golden opportunities to generate more leads, connect with new customers, and grow their business. This free downloadable e-report is packed with practical tips on how to get the maximum impact from your case studies and increase the return on your case study investment. To find out all this and more, download this incisive report now.